In order to take the Yelm Food Co-op to the next level, the Board of Directors has decided to seek a professional cooperative grocery manager to become the YFC General Manager. Ideally, this person has cooperatives in their blood and will want the challenge of taking the existing, successful retail store into its next 5 years of growth and profitability and of service to our members, our customers and our community. We are now in our 5th year and we just keep growing! Growth brings both opportunities and challenges and this is when it’s time to bring in an expert. Everyone involved so far has done an incredible job of growing us from a little shop with a few products and under 100 members to a growing, profitable store in a new location doing more than three quarters of a million dollars in sales and a membership pushing 1,100! We need to keep the momentum going and we need to have it going in the right direction. If you know anyone looking for a really exciting new opportunity, let us know at yfcstrategy@gmail.com. We currently have ads running on Craigslist and in several other locations and hope to begin interviewing candidates in October for a potential fill in December. Yelm Food Co-op now at Gordon’s Garden Center! Yelm, WA, March 27, 2012 – Kellie Petersen, owner of Gordon’s Garden Center, and Bill Wyman, President of the Board of Directors of Yelm Cooperative, are pleased to announce the relocation of the Yelm Food Coop Retail Store to the Gordon’s Garden Center complex during the month of April in 2012. Gordon’s opened in Yelm 47 years ago as a food market, and over the years expanded to include garden products including premium quality decorative and food producing trees and plants for the home gardener. Today, Gordon’s stands as one of the region’s premiere retail destinations for quality gardening products, and has achieved the Washington State Environmental Award of Excellence for their organic program. This year, Ms. Petersen is expanding Gordon’s services to include a Wedding Registry, Design on Demand, Personal Shopper, and an innovative Best Food Forward to better serve the Yelm Community. The Yelm Food Coop is the Retail Store Program arm of the Yelm Cooperative, a unique Community Service Organization focused on food education, access to farmer-direct safe and healthy organic foods, and long-term community food sustainability. Other planned Yelm Cooperative community service programs include Yelm’s first Farmers Market, and an educational community garden. Additionally, the Yelm Cooperative’s food-based educational programs will provide hands on training in growing, processing, home pantry rotation, and cooking. Gordon’s Garden Center and the Yelm Cooperative are forming a “Perfect Partnership” by operating independently yet together at the Gordon’s Garden Center complex. Organic and sustainable principals guide both operations, and provide the community with a centralized hub for shopping and access to their complementary services. Working together, Gordon’s Garden Center and the Yelm Cooperative help to promote a healthy and sustainable community, now and for future generations. You have Voted for Change! Our members have voted for us to pursue the new direction outlined at the Special Membership Meeting held Jan 28th. Yea votes = 107; Nay votes = 7. These results meet the Bylaws requirements that a 10% quorum of the members vote, and that a majority of those voting approve the resolution. We will be establishing the Yelm Cooperative as a 501.c.3 federally approved non-profit organization. It will oversee the programs of the Retail Store, the Farmer’s market and the Community Food Education Program. The latter will now encompass what was earlier seen as the Community Garden program. It will now become the “practicum”, or the hands-on aspect, of the education programs on gardening. The new membership structure was also approved and this will give us the ability to cover much of our operating costs, finance at least some of the expansion and will allow us to adjust prices downward in many cases. The Special Membership Meeting that was held on Jan 28th, 2012 introduced the plan for restructuring the Co-op into a federally mandated non-profit organization under the IRS code 501(c)(3). Please watch it and leave us a comment. That will help this video become more valuable in promoting your Co-op’s website. Enjoy! And then go the the store, pick up a ballot and vote for the new Co-op! 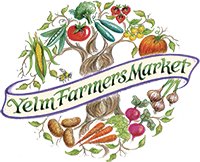 We are working hard to get the city government to broaden the rules for farmers markets so that we can build a really great one in Yelm. This article on Triple Pundit provides some hard data that supports our position that a farmers market in Yelm would be good for local farmers, for local shoppers and for the economy. Even the federal government recognizes this fact; they just seem to think huge subsidies for mega-farms and bombs is more important than supporting local communities. But, we can change their minds! …local farmers markets in the U.S. doubled from 2,863 in 2000 to 6,132 in 2010 and over 100,000 farmers are selling their products to customers directly. This came from a report released this month by the Union of Concerned Scientists (UCS) entitled Market Forces: Creating Jobs through Public Investment in Local and Regional Food Systems. Help us push the city officials to update their policies and procedures for farmers markets and then help us build on that will blow their minds!